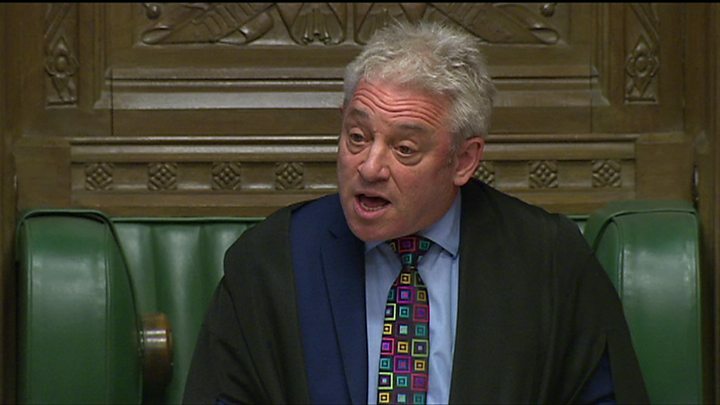 Commons Speaker John Bercow has thrown the UK’s Brexit plans into further confusion by ruling out another vote unless MPs are given a new motion. In a surprise ruling, he said he would not allow a third Brexit vote in the coming days on “substantially the same” motion as MPs rejected last week. But MPs who want to leave without a deal on 29 March welcomed the move. Mr Bercow’s ruling came as the government considers a third attempt to get the deal through Parliament. He said the second vote on the prime minister’s deal last week was “in order” but any further votes must pass the “test” he had set out in order to be allowed. The BBC’s Laura Kuenssberg said the Speaker’s intervention could have a “massive” impact on the Brexit process – with 11 days to go before the UK is scheduled to leave the EU on 29 March. Mrs May had previously committed to holding a new vote on her withdrawal agreement in the coming days, but ministers have said this will not happen unless they are “confident” of victory. What has the Speaker ruled? Mr Bercow made his ruling in response to what he said were concerns from MPs across Parliament that the government intended to “bring the same deal back to the House ad infinitum” and ask them to “repeatedly pronounce on fundamentally the same proposition”. Last week’s second vote on the deal had not fallen foul of parliamentary conventions, he made clear. This was because the government had secured “legal changes” to its existing agreement with the EU, set out in three new documents, and therefore what MPs had been asked to consider was different from the agreement rejected by 230 votes in January. But quoting Erskine May, the parliamentary rulebook, the Speaker said “what the government cannot legitimately do is resubmit to the House the same proposition – or substantially the same proposition – as that of last week, which was rejected by 149 votes”. This convention, he added, was “necessary to ensure the sensible use of the House’s time and the proper respect for the decisions it takes”. Pressed on what future votes would be allowed, Mr Bercow said would make an “honest assessment” when the time came and the ruling should be not be regarded as final. But he suggested there would have to be a “demonstrable” change in what MPs were being asked to vote on – “not different in terms of wording but different in terms of substance”. “The Speaker has made his name by being interventionist,” he said. Conservative former cabinet minister Owen Paterson said it was a “game-changer” and would “concentrate minds” ahead of a EU summit on Thursday – at which EU leaders will consider whether to grant the UK an extension to the Brexit process. He said the prime minister should make it very clear to her European counterparts that the “law of the land” stated the UK would leave, with or without a deal, on 29 March.